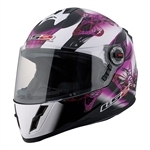 It is crucial to get a perfect fitting helmet to reduce the risk of injury in an accident. 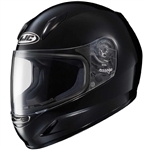 Browse our selection of kid's motorcycle helmets and please bring your child in to our New Jersey location and one of our experts will makes sure you leave with the correct fit and style. Children once mature enough to enjoy riding with you must wear proper gear to ensure safety. 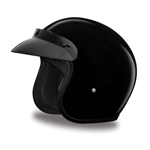 Be sure to purchase a snug fitting helmet that is not loose. 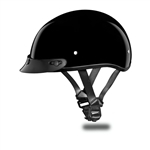 It is not recommended to buy a child's helmet "big" so they can grow into it, a loose fitting helmet will fly off in a crash and not protect the child. Be sure to check out our full selection of kids leather motorcycle jacket and riding jacket, as well as youth biker vests available in baby sizes up to big kids.